It should come as no surprise that the bigger Apple makes its iPhones, the better their batteries are, but a new report has some alleged specs for us to sink our teeth into. According to Chinese site IT168, the rumored 4.7-inch iPhone 6 will rock an 1,800mAh battery, and the alleged 5.5-inch iPhone 6 will have a 2,500mAh battery. That's a 15% increase in battery capacity over the iPhone 5S's 1,560mAh for the smaller iPhone 6, and an exciting 60% increase for the 5.5-inch phablet flavor. When the iPhone 5S debuted it had just an 8% increase over its predecessor, so Apple might finally be focusing on battery power as it makes its flagships bigger than ever. 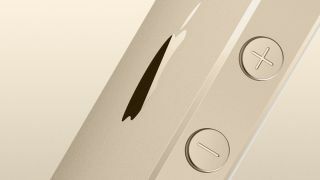 However, those rumored battery specs may still put Apple's new iPhones at a disadvantage to some competitors. To further pour it on, bigger batteries may not translate to battery life that is that much longer than the iPhone 5S either. The 5.7-inch Galaxy Note 3 is only slightly bigger than the 5.5-inch iPhone 6 yet it has a significantly larger 3,200mAh battery. And the smaller, 5.1-inch Galaxy S5 also has a bigger battery at 2,800mAh. Even with a larger battery, the probability that the new iPhones will be bigger than previous iPhones means they'll need more battery life to perform the same kinds of tasks. So while the batteries are bigger in size, it may not translate to longer intervals between charges.